This is a collection of poems from the literary heritage of the Hobbits, The Red Book of Westmarch, as collected by Bilbo, Frodo, Sam, and friends. Authorship of particular poems is variously attributed directly to named Hobbits, along with suggested lineages that go back even to Gondor. 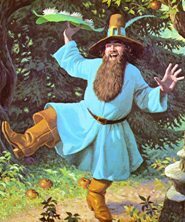 The first two poems are about Tom Bombadil and his many adventures, including his wooing of Goldberry. Thereafter the subject matter is highly varied: The Man in the Moon, Bilbo's trolls, Sam's oliphaunt, a dragon's hoard, and even cats. Some of the poems have a strong Elvish influence, dealing with such ethereal subjects as fairy princesses and shadow brides. The Sea is also a recurring theme. ...and Frodo's disastrous recitation of "The Man in the Moon" at the Prancing Pony in Bree. and their song has faded. Anyone who enjoys the poetry in The Lord of the Rings will enjoy this simple but typically wonderful Tolkien collection.